At RHRLI we offer the most accurate, state of the art transplants you can find on Long Island. In fact, we’re the only hair loss treatment center on Long Island that offers the ARTAS® System which uses robotic technology to give you a new healthy head of hair. We’ve performed all types of hair transplants at RHRLI and we want to let you know how beard and facial hair transplants work. There are several reasons why a patient would want to get a facial hair transplant. Some people don’t have the ability to grow facial hair easily. Or they’re concerned that they may look to young. Some people want to have a thicker beard because they feel it enhances their personal appearance. 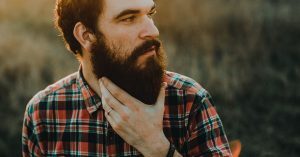 In fact, the transplant has a reputation for being favored by “hipsters.” One beard transplant patient named Justin told KPRC TV in Houston. “I just wanted a more distinguished look. I’ve always wanted to be able to grow like a full beard,” he said. Dr. Steven Gabel, a Portland, Oregon based hair transplant specialist told CNN that facial hair transplants are popular there. “In the Northwest here, there are a lot of men with facial hair, and they like to show it,” he said. Gabel says most of his patients are people who already have beards but are looking to fill out patches. Facial hair transplants operate very similarly to hair transplants that you see on the top of the scalp. In both types of transplants, the hair is taken from a donor area that’s usually on the back or the sides of the head. But instead of moving the follicles to the scalp, the donor hairs are transferred to the beard and mustache area. “These hairs will grow like beard hairs,” Dr. Jeffrey Epstein, a Miami based dermatologist told Men’s Journal. The transplanted hairs will fall out, about two to three weeks after the transplant, but they’ll grow back permanently in a few months. It will look natural and healthy even if your beard is a slightly different color from the hair on your head. If you’re looking to beef up your facial hair or if you’re looking for a more traditional hair transplant on a scalp, RHRLI can help. If you’re looking for a hair transplant with the ARTAS® System, you’ll be back to your normal life in no time. That’s because the ARTAS® System is minimally invasive. Unlike other hair transplants like strip surgery, patients that use the ARTAS® System report very little pain. To learn more, contact us today.